Earthquakes are generally considered to be by-products of plate tectonics. As the continental plates that make up the surface of the earth slowly drift across the globe they crash into each other in infinite slow motion. And the result is an earthquake. At least that's the commonly held theory. In Japan there was another idea. 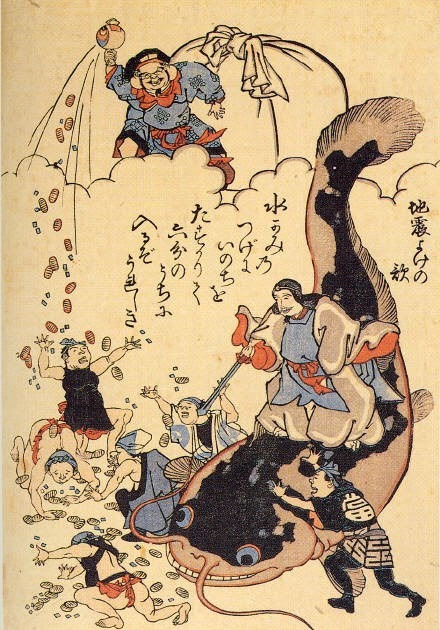 It wasn't continental drift that had anything to do with it but a giant catfish, a namazu, far underground that when it thrashes around, the earth shakes. Normally the namazu is restrained by a god holding it down with a large stone, but every now and then it wriggles free and causes chaos. And as this is now known to be the cause, the symbol for an earthquake emergency is now a catfish. 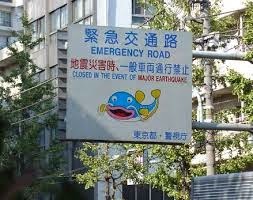 The emergency service roads that provide access across cities and country in the case of a major quake are marked with a prominent fish. Keep clear if see one when the time comes and happy fishing. Whales vs AKB48 - which is the more traditional?